Shell Weight: 2.96lbs. Blast radius: 15 yds. Uses a 4-increment powder charge system. Maximum effective range: 1000 yds. Which weapon should you purchase when joining Fox Company??? There is always much debate when joining up as to what weapon you should purchase and what weapons the Parachute Infantry Companies carried. To help answer this debate I will turn to an expert in Mark Bando and the below is an excerpt from his site Trigger Time. Mr. Bando is the official historian for the 101st Airborne Division and has interviewed and talked with veterans for decades. The answer for the above question is the M-1 Garand and the reason is below. 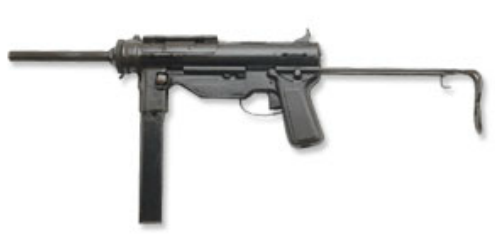 "Who carried which weapons and why didn't all paratroopers carry the folding stock carbines, which were especially designed for them?" Most members of a rifle squad were armed with 30-06 caliber M-1 Garand rifles, which were a much more potent weapon than the carbine, which lacked range and knockdown power. The M1-A1 carbine with a folding stock, was issued to officers, also to some members of crew-served weapons (i.e. 60mm mortar squad), while non coms(sergeants) carried the M1-A1 or M1928A1 Thompson submachine-gun. This included Staff Sgts (platoon Sgts) and 3 stripe Buck Sgts (squad leaders). These weapons were prescribed by the TO&E (Table of Organization & Equipment), but individuals frequently opted for-and usually got, whatever they wanted. This switching was done on the battlefield, if not accomplished prior to a mission. 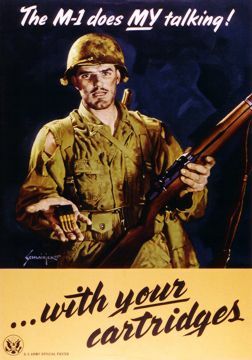 Since the M-1 Garand was the best all-around weapon, many officers also used it, instead of the carbine, and some noncoms swapped their TSMG for an M-1. 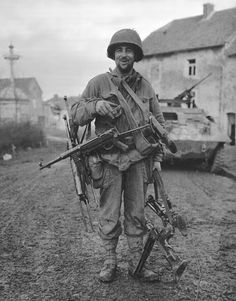 Some members of crew-served weapons also preferred the M-1 over the carbine, despite it's extra weight, when they were also carrying such items as MG ammo, tripods, baseplates, mortar tubes, 40lb A-4 machineguns, etc. If all the paratroopers had been equipped with carbines instead of M-1 rifles, it would have been a lot more difficult for the 101st Airborne to win any battles. Each rifle squad contained a LMG crew, (instead of the B.A.R. 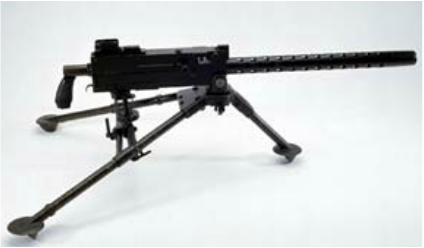 found in regular infantry companies) and the PIR squad tactics were built around the LMG laying a base of fire. The officer breakdown was as follows: Company Commander was a 1st Lt or Captain, with a 1st Lt. as company XO(Executive Officer, meaning 2d in command). Each platoon had two Lts, (a 1st Lt plt leader and a 2d Lt asst. platoon ldr). Each platoon also had 1 staff sgt, who was the platoon sgt (in a regular infantry platoon, this job was performed by a Tech Sgt), and four buck sgts, who served as the squad leaders. Each squad also had a corporal, who served as assistant squad leader. Each battalion had 1 Headquarters company and 3 rifle companies. The Bn HQ Co. was a bit larger, numerically, than a rifle company (closer to 150 personnel) and had a 81mm mortar platoon, a LMG platoon and a communications platoon, also a bn. Mess Section. HQ Co. 1st Bn supported A,B, and C companies. HQ Co 2d Bn supported D,E, and F companies. HQ Co 3rd Bn supported G, H, and I companies. note: The Browning Automatic Rifle (B.A.R.) was not issued to WW2 paratroopers because it was considered too awkward to jump with. It was not listed on the TO&E for Parachute Infantry rifle companies. The weapon weighs about 20 lb and is four feet long and cannot be broken down for jumping purposes. This is why squad tactics centered around the LMG (dropped in bundles) instead. The B.A.R. was an effective and devastating weapon and immediately after WW2, the 82nd and 11th Airborne Divisions incorporated them into their TO&Es and devised a method of jumping with them fully-assembled, and strapped alongside the parachutist's leg, muzzle down.